Heat the butter and olive oil in a small sauce pan until very warm, about 180 degrees. In the bowl of a food processor or in the jar of a blender, add the vinegar, lemon juice, salt, pepper, and egg yolks. Process briefly to blend everything. With the motor running, slowly drizzle in warmed olive oil and butter. In a saute pan set over medium-high heat, add two tablespoons of extremely fresh, low FFA below .3, high phenol (above 300 ppm) fruity-green extra virgin olive such as Oro Bailen Picual. Add the shallots, broccoli, and cauliflower and saute until golden brown, and slightly caramelized (about 20 minutes) add the garlic at the last minute. Add the coarsely mashed potatoes to a large bowl and add the goat cheese, pepper and salt. Add the caramelized veggie mixture to the potatoes and mix gently, keeping the veggies in tact as much as possible. Add the beaten egg to wide flat container or bowl, and add the Panko bread crumbs to another bowl. Season the egg with a little salt. Once the potato mixture has cooled enough to handle, form six patties, about 4" wide and 1" thick. Dip each patty in to the seasoned egg, and then in to the Panko bread crumbs making sure to gently press the crumbs on to the patty. Set the patties on to a lined baking sheet and set aside. Heat 1/2" of Oro Bailen Picual in a wide heavy saute pan over medium-high heat until it reaches 325 on a deep fry thermometer. Pan fry the patties until golden brown on both sides - set aside on a lined baking sheet. To assemble, arrange the mixed baby greens on the plate. Top with the warm veggie patty. 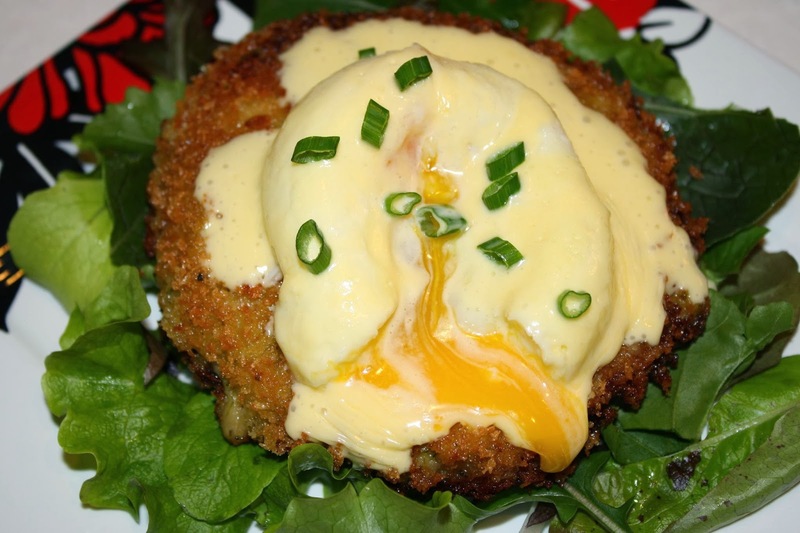 Set a poached egg atop the veggie patty and ladle the Hollandaise over the top.